Summer means also seaside, getting inspired by the seaside doesn't necessarily mean blue, white, and red. More exotic destinations, the underwater world will give us plenty of strong colorful ideas. Strong colors for a modern interior design. 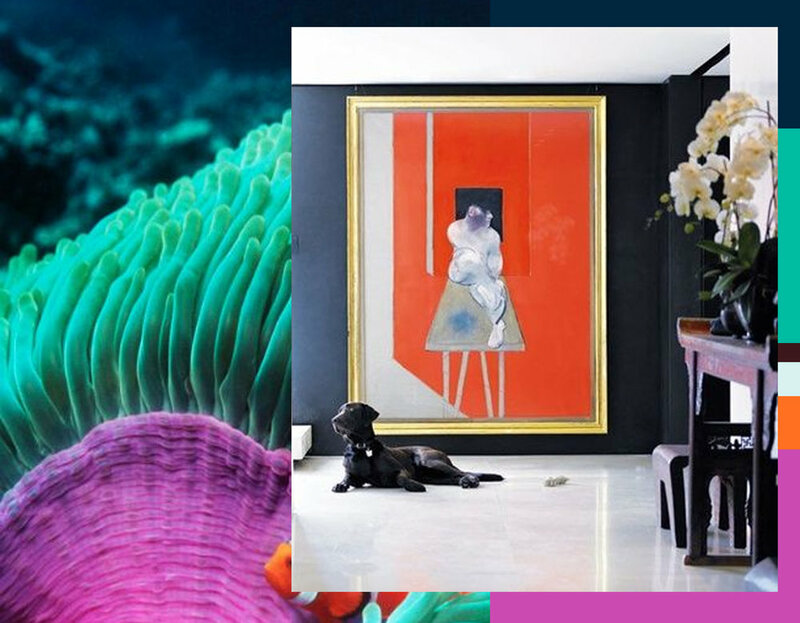 An oversize painting in strong colors will make a great impact in your entrance. It will ask some courage, but once you will decide you go for it you will see that it will make the center space of whatever the room you will put it in. Strong summer colors are perfect for outdoors, the sun is giving you now the energy and vitamines for winter. Think of countries such as Mexico where the summer is all year round. They have a joyful way of combining colors. The more sun we have to more colors we can use. Spice up your classical interior by using strong summer colors. Warm color harmony to seduce even the more contemporary persons. Now the market places are filled with flowers, colorful combinations. Mix them up with green, you can combine every color with green, let the flowers on the market inspire you. The burst of color will give life. Summer is the perfect season to travel. Morocco, India, Bali, Mexico, let them inspire you even when not traveling so far. Don't be afraid to mix up colors. Some times people ask me how many colors they can mix in a room. It all depends: you need some basic colors, one stronger accent color which you than can repeat in small amounts. It is all about balance. Let this not stop you to be creative and try out different color harmonies. It can go wrong, it can be to much, specially when in a room of the house. But make a special corner in your garden, it is the season to live outdoors. Colorful chairs, napkins, glasses, plates: just combine and enjoy. Summer also means time off, holidays, long days, moments to be creative. Strong colors will give you energy and will inspire you. Did you ever think of using neon pastel colors? Pastel colors in general are to sweet, fitting only a little girl's room. Grayish pastels can be stylish. Neon pastels are modern and will give a contemporary fresh look to your interior. You can make some unexpected color harmonies. Neon pastel colors can be a perfect color harmony for a modern interior. Easier to use than strong colors, and they will look very energetic during winter. 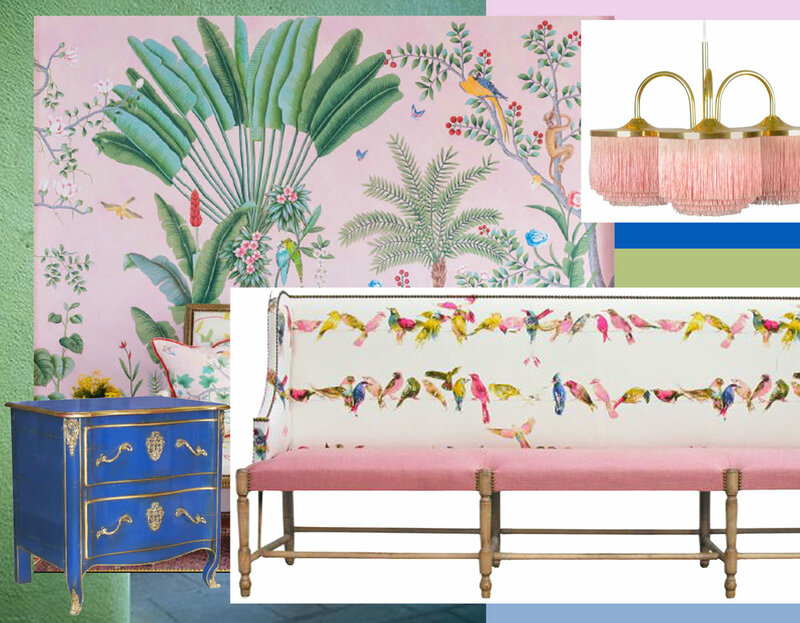 Pastels can be to romantic, but neon pastels will even make classical furniture look modern. So give your old chest of drawers an upgrade, look for some funny fabric to re-upholster a boring, classical chair. Warmer temperatures invite us to take advantage to spend more time outside, to travel to the beach, let the sun bleach our hair, and make our skin glow. Nobody will tell you that you are lazy when just doing nothing all day long. We will travel and fall in love with the old tiles, the handmade ceramics sold on the local market. We might find even some vintage tiles to take home. We have time to get inspired, the best ideas come when you relax, so stay open. Combine a vintage look or some patina with very modern graphical furniture and rugs. Stripes in shades of one color will give a modern touch to accessories for the home. The sun bleached colors, the ethnic inspired motifs will bring a summer touch to your home all year round. A bohemian theme is for travelers bring home things from all over the world. Combine them with confidence and it will reflect your personality in your home.